In a perfect world, once a couple of lovebirds decide to spend the rest of their lives together they’d simply relax, enjoy each other’s company, and anxiously await the big day while all of the big arrangements were made for them. Unfortunately, that is not the case — at all. The time leading up to the wedding, while exhilarating, is extremely hectic and stressful for the groom, but more often specifically for the bride. After years of dreaming of the perfect ceremony, the time has come to make it a reality, and that involves a lot of important decisions to be made. Which wedding venue in Colorado do you book? Who do you invite? What kind of cake do you want? DJ or band? The list goes on and on. Luckily, we’ve got the perfect venue for you, so that’s one less thing to worry about! 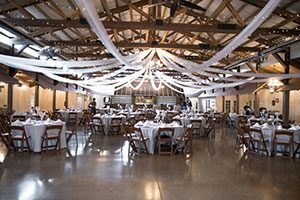 At Church Ranch Event Center, our outdoor grounds are nothing short of breathtaking, and our event hall is rustic, spacious, and beautiful. And herein lies another choice to be made. Do you want an indoor or outdoor wedding? The good news is that no matter what decision you make, we promise your wedding will be picturesque. But if you’re on the fence, hopefully, this post will help you lean one way or the other. After you’ve decided, contact us so we can all start planning your perfect wedding! Weather– Colorado is known for its erratic weather, it could snow one day, rain another, and be 75° the next. 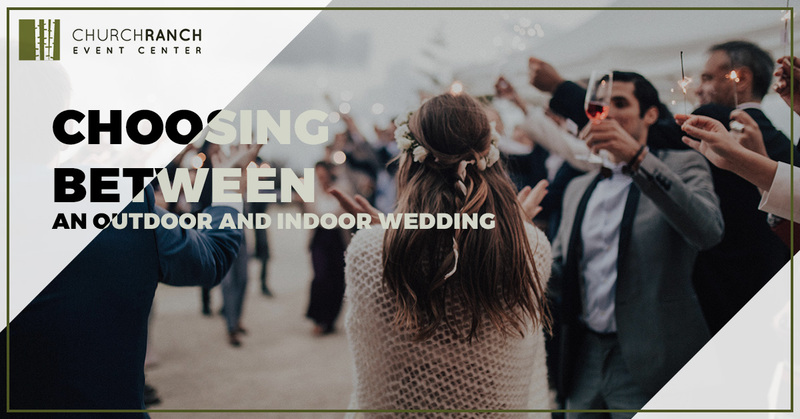 Luckily, choosing our indoor event hall will alleviate any stress you would get crossing your fingers and constantly refreshing your weather app, hoping for the best. A More Intimate Setting– In our banquet hall, you’ll have all of your loved ones in one room, making it easy to greet all of the attendees, and for everyone to share the joyous occasion together. Also, our venue has ample space so that none of your guests will feel cramped. Customization– An indoor setting gives you vast opportunities for decor and design. You’ll be able to decorate as much as you want, with no worries about the wind or rain causing damage. Some of the negatives involved with choosing an indoor wedding is that you don’t have the picturesque views that the Rocky Mountains have to offer, the size can’t be adjusted so you’ll have to be set on your guest list, and the decorations and flowers will cost more than utilizing our outside venue. 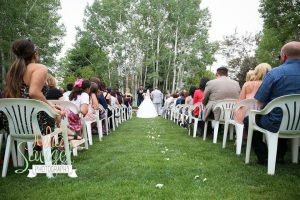 Gorgeous Scenery– You won’t find an outdoor venue quite as beautiful as ours in the Denver area. Our 7 acres consist of gardens, flowing fountains, and prodigious Aspen trees. Lighting– Natural lighting offers a beauty that lightbulbs can’t compare to. This will help make your wedding pictures truly convey the special charm of your big day. Spacious– Our outdoor grounds will give your guests the opportunity to freely walk around and explore, as well as enjoy the fresh mountain air that Colorado is known for. Obviously, the main issue with having an outdoor wedding reception is the possibility that the weather will turn on you. A bright and sunny day could become windy and rainy in a heartbeat. But if you’re willing to take the risk, there’s nothing quite as beautiful as taking your vows as the sun’s rays embrace you and the love of your life. We hope that this gave you a little bit more information to help influence your decision. If you’re ready to schedule your big day at our wedding venue, or would like to book a tour, contact us now!